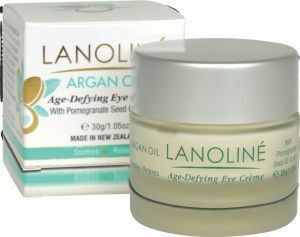 LANOLINÉ Argan Oil Age-Defying Eye Crème helps sooth and relax the delicate muscles around the eyes, helping to reduce the appearance of fine lines and wrinkles. Enriched with natural Argan Oil, Pamegranate Oil and Vitamin E, combine to hydrates, soothes and relax strained eyes. Directions: Gently apply around the contours of the eyes, using the finger tips in an upward outward motion. Use morning and evening. Ingredients: Aqua, Prunus Amygdalus Dulcis (Sweet Almond) Oil, Glycerine, Cetearyl alcohol, Cetyl Alcohol, Stearic Acid, Glyceryl stearate, Argania Spinosa Kernel Oil, Punica Granatum Seed Oil, Sodium PCA, Benzyl Alcohol(and)Salicylic Acid(and)Glycerin(and)Sorbic Acid, Triethanolamine, PEG-20stearate, Tocopheryl acetate, Citric Acid, Actinidia Chinensis(Kiwi) Seed Oil.